Bank of America continued to display a message on its homepage Wednesday warning users that its site is having delays. NEW YORK (CNNMoney) -- Bank of America's website woes continued into their sixth day on Wednesday, with customers complaining that they are still sporadically unable to log into their accounts online. The site's troubles began on Sept. 30, one day after the bank unveiled its $5 monthly fee for debit card customers. The company declined to comment on the root cause of the problem, but Bank of America insisted it was not hacked. "Every indication is that recent performance issues have not been the result of hacking, malware or a denial of service attack," said Tara Burke, spokeswoman for the bank. For much of the day on Wednesday, Bank of America (BAC, Fortune 500) replaced its homepage with a message warning customers that they may experience performance issues while using the site. "Our online banking systems are available to customers," Burke continued. "Given the last few days, we are rigorously monitoring our online banking system, and chose to continue deploying an alternate home page to ensure that customers get to the right destination quickly." Burke said there was no timeline for when the site's functionality would return to normal, and the bank is still "assessing the situation." Yet on Friday, when CNNMoney first inquired about the outages, she also said that the bank was investigating the problem and that the site would soon return to normal. Six days, later, the problems persisted up until around 2:30 p.m. ET, when bankofamerica.com returned to its normal homepage. Bank of America declined to comment on whether the return to its regular homepage meant that it had solved the issues plaguing its page, only continuing to say, "Our online banking systems are available to customers." Though Bank of America has remained surprisingly silent about the cause of its disruptions, experts said the increased latency time was typical of a website that had been overloaded with traffic. That can happen for one-time events like Black Friday for e-commerce sites or situations like the launch of the Missoni line at Target (TGT, Fortune 500), which brought target.com to its knees last month. It can also occur when there's a Denial of Service attack. DoS attacks aren't technically "hacks," but attackers overwhelm a website's servers by flooding them with requests. That makes websites unreachable or unresponsive. There's not much that Web companies can do to prevent that kind of attack except to get more servers. The timing is certainly curious, though experts can't be sure whether the increased traffic -- if that is the cause -- was natural or because of an attack. "I can't say with any certainty whether it's a DoS attack or legitimate traffic, but the patterns tell me that site slowed down to an increase of server requests," said Shawn White, vice president of operations at Keynote, an Internet monitoring company. Keynote found a pattern over the past six days at bankofamerica.com in which the site slows down to a crawl beginning around 8 a.m. to 9 a.m. ET. At intermittent times throughout the day, the slow-down has become so significant that it affects availability, White said. "I've been with Keynote for 16 years, and it's very, very rare that we've seen something like this," he noted. "But I've never seen anything this severe, affecting the largest banking institution for this long, for this many people all across the country." Monitoring firm AlertSite also detected a series of Bank of America website slowdown and outages, beginning on Friday and continuing through Wednesday. 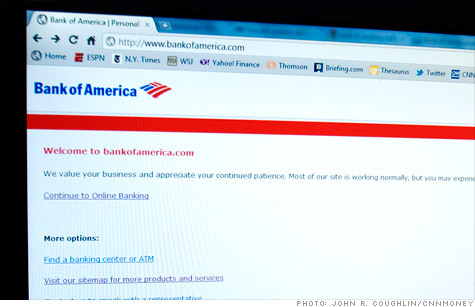 Bank of America's website suffered a one-day outage in January thanks to a glitch in a a routine system change. At the time, the company also fended off rumors that it was being hit by a denial of service attack orchestrated by Wikileaks supporters, after the organization's founder Julian Assange told reporters that a large U.S. bank would be its next subject of leaked documents. Chase's online banking service experienced a three-day outage a year ago. -- CNNMoney staff reporter Charles Riley contributed reporting to this article.